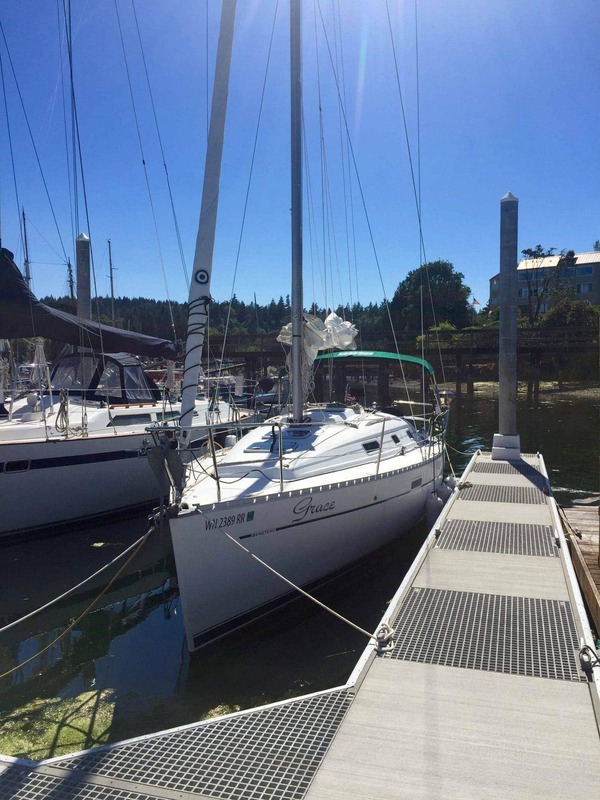 The first official sailing adventure with our new sailboat Grace was planned for 3 days – Friday through Sunday – in mid July. As Josh was already somewhere else, I conscripted my best friend JJ, and another close friend Heather to be my crew. 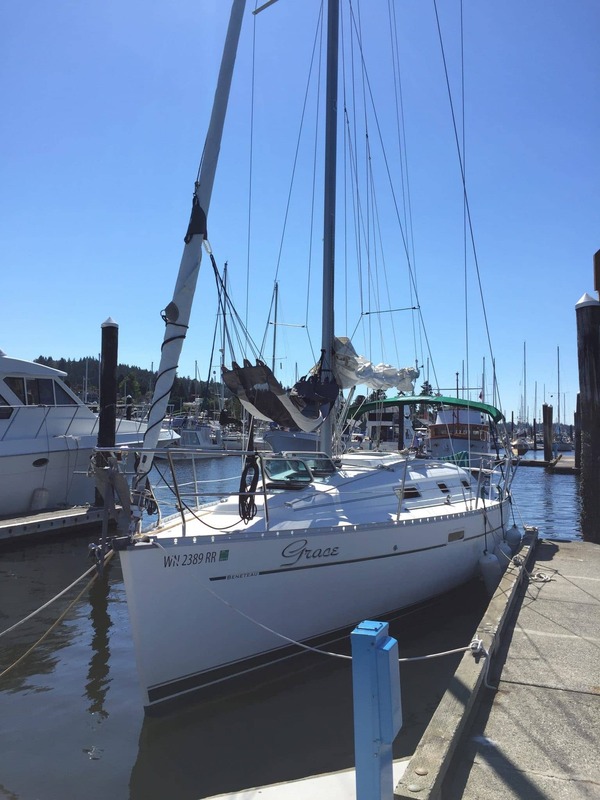 Our trip would start at Elliott Bay Marina, end up for one night at Poulsbo, and then conclude at Winslow Wharf Marina on Bainbridge Island. This was my first time leaving the marina with Grace after purchase and moving her. She tends to back fine, but control is sluggish. While fighting with that, Heather was using the boat hook to push us off a boat that was nearby, and slipped, her body folding over the lifelines. Thankfully she stayed on the boat, but the bruises were going to hurt! She lost her favorite set of sunglasses too, right in front of my slip neighbors. Not the best way to start the day. 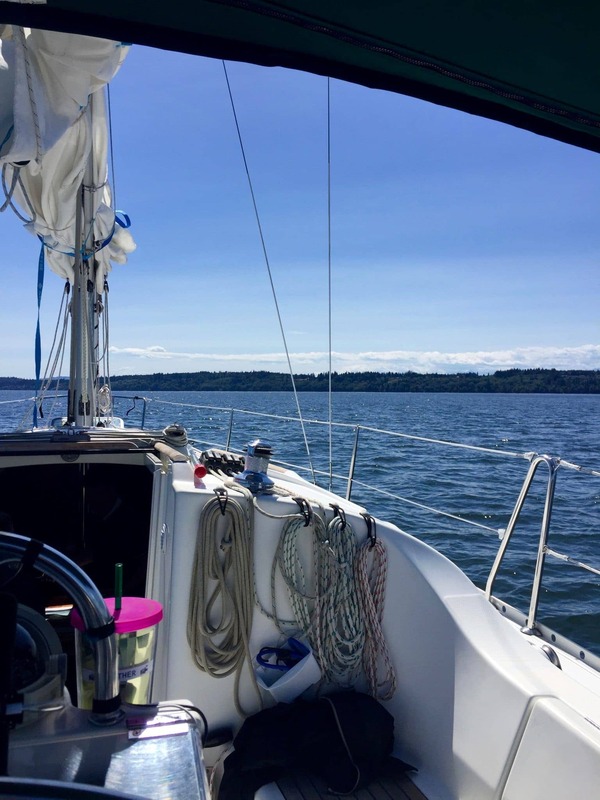 Grace was sailing extremely fast from the tip of Discovery Park / Magnolia towards the north end of Bainbridge Island. 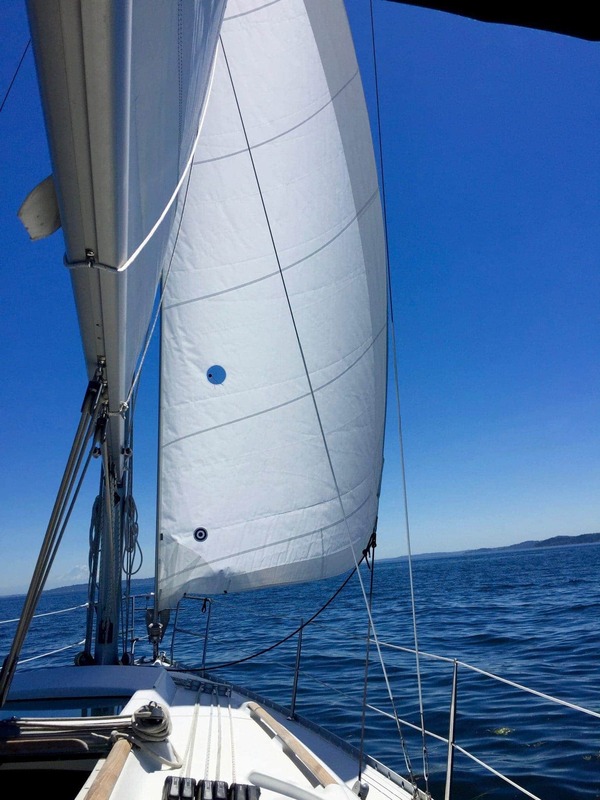 We were positively flying, and I was getting used to adjusting the sails. In retrospect compared to what I’ve seen elsewhere about this year/model/rig of Beneteau, I should have probably thrown in a reef on the main. In fact, we only had the main out, and were cruising along at 8 knots! I was already in love with the way she sailed. Several large containerships had gone by, and we’d hit huge waves generated from them, one big enough to break a mount on the cockpit table, and generally get everyone wet. Suffice to say, the crew was a bit apprehensive about the size of the waves. The normal waves were 1-3 feet and building, but Grace dealt with those just fine. As we got to the north end of Bainbridge Island, near Port Madison, I saw in the distance a strange sight on the edge of the shipping lanes. It was about 2 miles away but I could still make out something very odd moving on the water. I have fantastic sight, and the rest of the crew couldn’t see much. After getting out the binocs, I was able to see two people who appeared to be standing on the water, and immediately knew they were on a capsized boat. I ordered the crew to take over specific roles – neither of them had really ever been involved with anything like this before. JJ was responsible for watching the people through the binoculars no matter what, and pointing them out when needed. Heather was assisting me in dropping the sails and stowing everything in case we needed to render assistance. We quickly began to motor at maximum speed towards them. As we got closer, it was clearly obvious that they were capsized, and that things were serious. Upon arriving on scene, I attempted to communicate with what looked like the captain, but he was very dazed and confused. His 7-8 year old son was sitting next to him on the top of their vessel. 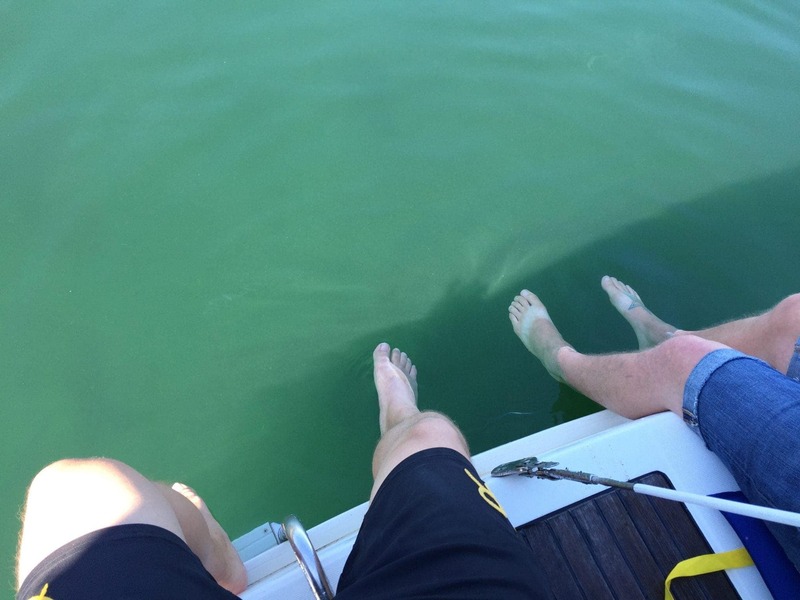 While it was July in Puget Sound, the water temperature was less than 60F and they had been in the water at least for 30 minutes, if not longer. I saw no PFD’s, no radio or other communication device. All around the boat there was debris and lines, rigging and other things that looked like a nightmare to get close to. 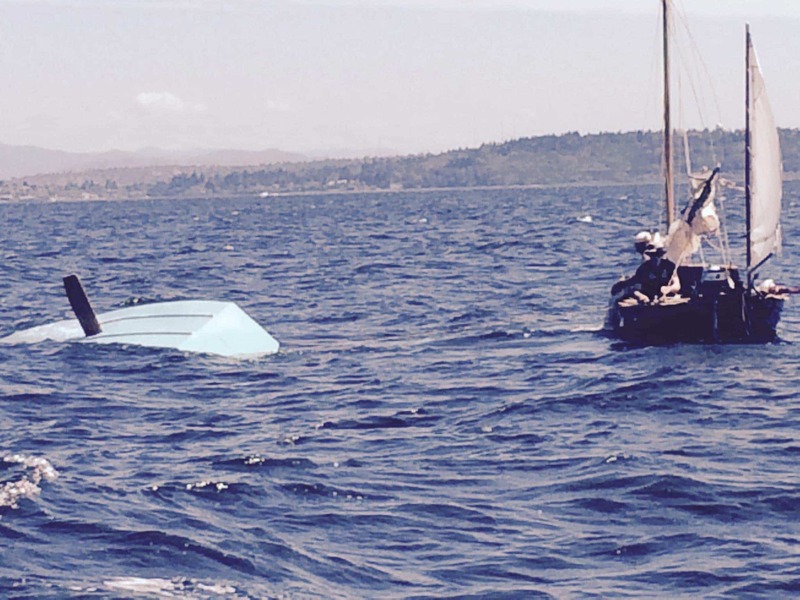 We didn’t have a dinghy so we couldn’t render aid that way, but we prepared blankets, PFD’s, and more in case. I had been on the VHF with the Coast Guard advising them of the situation, that there were people in the water, and a vessel overturned that was a hazard, drifting towards the lanes. Heather was piloting the boat in good circles around the wreckage, JJ was on watch, and I was below communicating on the VHF, albeit poorly because of problems with the radio. After 30 minutes on site, circling the wreckage, asking repeatedly if they wanted assistance, and actually getting within 10 feet several times, throwing them ropes to come aboard, another small sailboat sailed right into the mess of lines and crashed into their boat. We were completely taken by surprise. We attempted to communicate with this vessel as well, but the captain wanted nothing to do with us, even telling us to go away, which we were **not **about to do. We were drifting towards the shipping channels, and the wind was increasing. 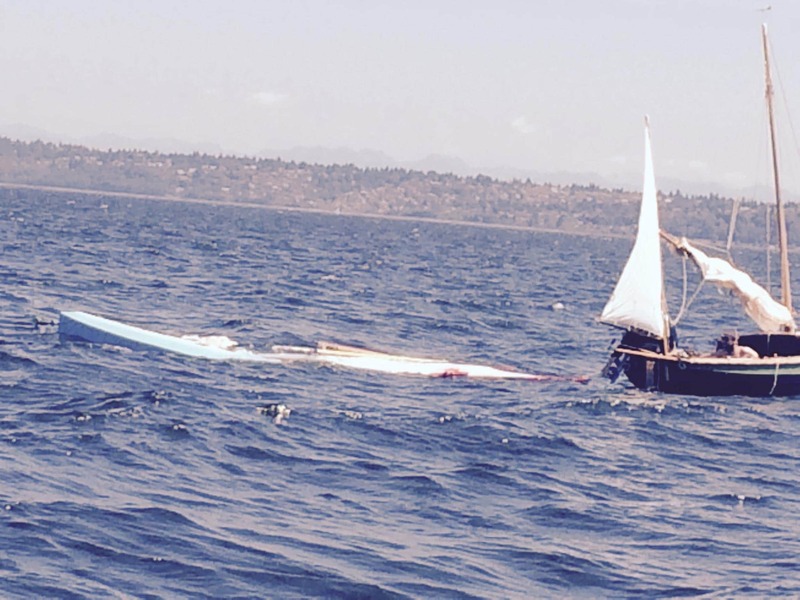 Vessel capsized with rescuing vessel nearby and fouled in their lines. I was continuing to communicate with the Coast Guard, and tried to get the new captain who was obviously trying to help them to give us info on the survivors. Within about 20 minutes he was able to get them on board his vessel, but he was now hopelessly mired in their rigging, having approached from downwind instead of using the clear upwind path that we had tried, and advised over the radio. The rescued captain and his son had no shirts, only shorts, and looked positively freezing. They were very dazed and didn’t respond to our communications. We got extremely close a number of times (at least 5) to the new boat and offered blankets, clothes, etc. but the new captain yelled at us to get away and actually threw stuff at us. What is this guys deal! These people are probably massively hypothermic, and they need attention right away. His boat has no cabin and no protection, so they are going to continue to be exposed to the wind and not get warmer. We circled for almost an hour, offering help, continuing to communicate with the Coast Guard, who asked for pictures and other reference information. To our shock, the new captain first cut himself free, and then proceeded to spend 30 minutes connecting himself to the boat to tow it. Their destination was 5+ miles across the active shipping lanes to Shilshole. His boat had a 5hp motor that looked like they’d make 1-2kts while towing. Vessel under tow. You can see the former captain of the vessel and his son crouched in the small boat. In all the years I’ve sailed, I’ve never seen anyone refuse help that was so readily available, and make terrible choices with two people who clearly needed medical attention. We tried so many times to offer them help, even got right up to the boat and said we’d jump over and help them come aboard, but the new captain of the rescue boat wanted nothing to do with it. By now, I’d been on the VHF for an hour and a half, and there were 5 other boats in the near vicinity watching. It was also 3pm on a busy boating Friday, and tons of people were listening in. We followed them towing the boat for another 25 minutes or so, and then advised the Coast Guard we were going to break off our support on-site and proceed to our original destination, Poulsbo. It took a long time for the adrenaline to wear off, but I will never forget the look in the captain’s face, his son crying, and the “rescuer” who probably did more harm than help. It was interesting to note that this appeared to be a home made craft of very odd design, potentially unballasted, only with a centerboard. We saw it roll over partially several times, and it looked sort of like a flat bottomed mini-barge with a big cabin, single sail and headsail, and odd design. With the winds blowing at 15kts gusting upwards to 20-25, and 1-3 foot waves, plus the huge waves from the container ships, I don’t think they ever had a chance sailing out across the channel. 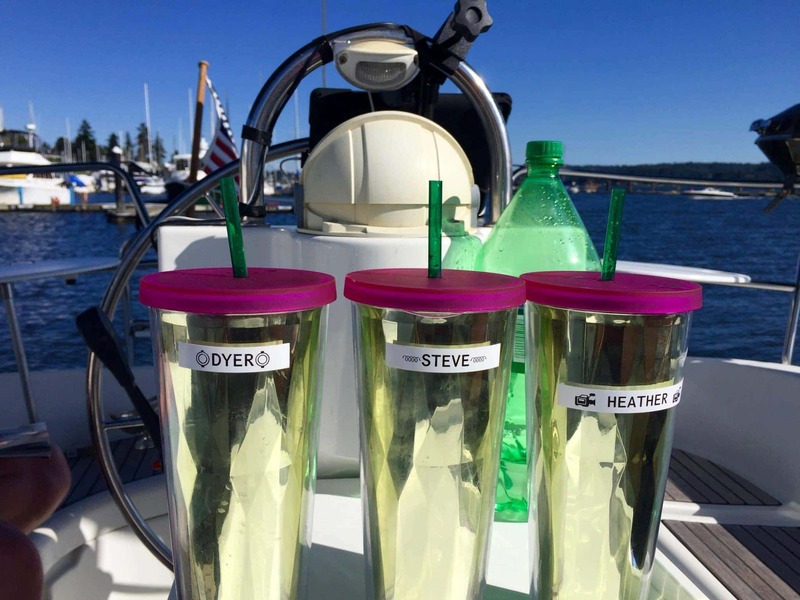 We motored on to Poulsbo, arriving hours after our expected arrival, but knowing we did everything we could to help them. I hope they got home OK and recovered from their ordeal. I never heard, even though we gave our contact info, pictures, WN numbers for the rescuing vessel (the capsized one didn’t have one!) and more to the Coast Guard. After a few hours at the dock, we were approached by two different groups of people asking if we were “that Grace that was on the radio all afternoon”. Apparently the majority of the folks at the marina and on the water were listening to our conversation and following the drama. Makes sense since we were on VHF 16/22 for that long, and most folks (as they should!) monitor those channels. By this point, we needed a drink (or two) and to relax, which was easy to do at Poulsbo. At the same time, the Poulsbo Police were walking up and down the dock, asking folks if they wanted a free inspection for safety, etc. which we declined. We’d had enough drama for one day. What was amusing was that our slip neighbors, you know, the ones that watched us back out of the slip like amateurs, and Heather nearly fall over, were right across from us at Poulsbo! The sunset was fantastic – one of the best I have seen in a long time. Pictures never do these justice, but here’s one anyhow! The first overnight trip for Grace went well, everyone was comfortable, the air conditioning was the hit of the evening, and we played cards and enjoyed ourselves late into the night. 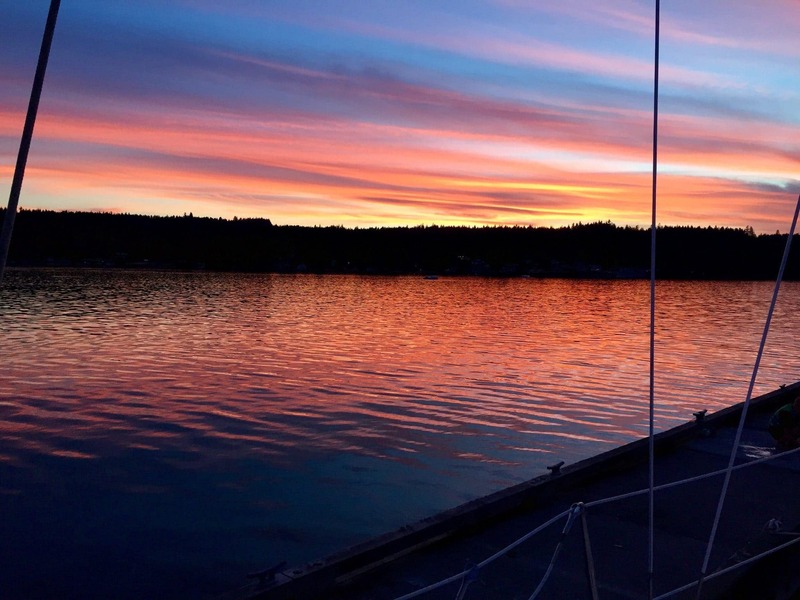 On the dock at Poulsbo. First trip anywhere for Grace! The next day we enjoyed Poulsbo and all it has to offer for part of the day, and then began our journey back out through Agate Pass and down to Winslow on the opposite side of Bainbridge. The crew saw all sorts of swimming things, and we generally enjoyed the sail, albeit slower than the day before. At Blakely Rocks, we sucked up all the sails, and motored in to our spot at Winslow Wharf Marina, which I hadn’t been to in years. Within the last year, it had gone through a total remodel, and the docks were absolutely fantastic. The marina is easy to navigate when looking for your slip – I appreciate that they have clear signage on the end docks, unlike many other marinas who have let this slip over the years. Our spot was the second to the last slip from the shore, and on the farthest float, right up against an elevated walkway for another marina. Both JJ and Heather were a bit worried about docking so far in, and not having a lot of room to maneuver, but I put Grace right in against the dock without anyone having to step off, and made it look like I’d owned her for years! She’s super controllable when docking going forward – reverse is a totally different matter with that fat, flat back end! Our favorite place is Doc’s Marina Grill, with it’s fantastic steaks at night, and absolutely essential chicken fried steak and mimosa’s in the morning. We had a fantastic time hanging out, watching the Sounders game at Doc’s, playing cards, and generally enjoying life. The next day we motored out of Winslow, avoiding the ferries and other traffic, and down past the point to Blake Island, one of my favorite quick spots to visit from the home marina. We picked up a mooring ball on the east side of the island, and just lounged in the sun, stuck our feet off the stern (a first!) and waited out the usual Sunday rush back to the marina. Around 5pm we headed back to Elliott Bay Marina under motor, and hung out at the dock with the air conditioning going strong until about 8pm. Everyone dispersed and went home after a successful first voyage for Grace, along with a bit of excitement! I hope future trips are just as fun, but without the drama!